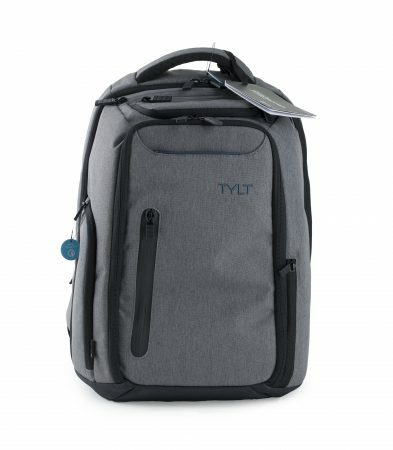 TYLT has a wide range of powering solutions for all kinds of tech users, whether you’re mainly stationed in an office or you’re a heavy mobile device user on the go. 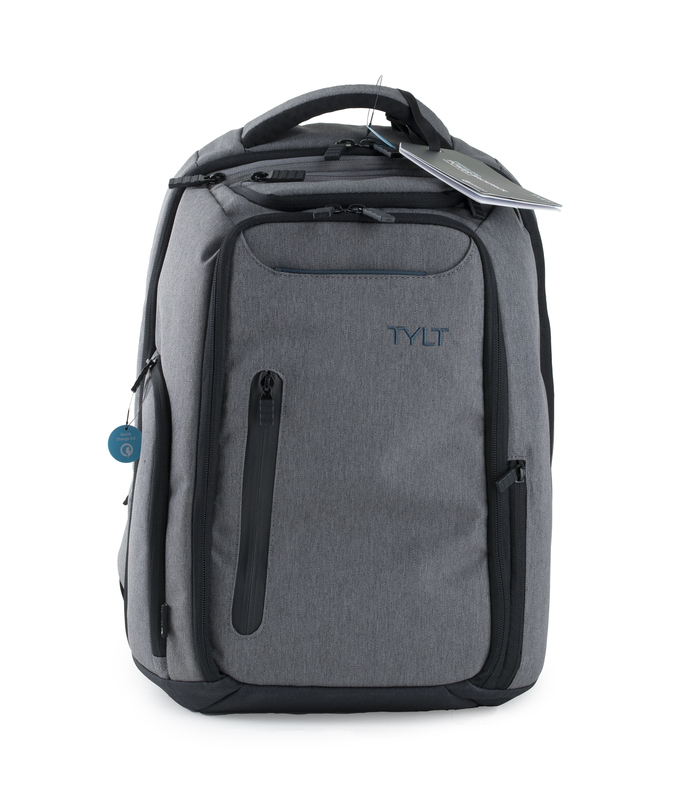 Where TYLT thrives is in the portability of their products as well as the functionality of their products. We’ve covered our fair share of TYLT products, so it’s exciting to take a look at an upgraded model of a product we covered in the past. Now, years after our review of the ENERGI Backpack, we have our hands on the new ENERGI PRO Power Backpack. Let’s dive into this new version of the power bag by TYLT. The ENERGI PRO is a backpack designed to handle the bulk of your on-the-go device charging needs while keeping its contents nice and tidy. It houses a bevy of pockets and compartments for laptops, tablets, phones as well as other items you take with you in your day-to-day travels. It’s dimensions are 17.5″ H x 14″ W x 9″ D with Grey 600D Snow Grain Polyester 210D lining and stainless steel zippers. On the outside, you have mesh padding for the back and under the top of the shoulder straps. Against those shoulder straps are removable sternum straps, giving you the option of extra wearing stability. You also have a paddled handle along the top of the bag as well as a luggage pass-through for sliding the bag through luggage handles. Mainly, the ENERGI PRO has a large main compartment in the front, a tablet sleeve, a mobile device and sunglasses pocket on the top, and another large compartment in the back for laptops. Throughout the ENERGI PRO, you have a considerate cable management system with built-in guidance straps and 11 pass through pockets. Six of those pockets are “quick-access” pockets, with one being magnetic in the front, another housing netting for drinks, one for providing RFID protection, and yet another for housing the battery. Inside the two largest pockets, you have yet even more pockets and sleeves, giving you tons of sorting options. The ENERGI PRO has pockets for days, giving you almost no reason why you can’t bring every kind of mobile electronic you own with you on your travels. Have some unimportant item that you’d like the fastest access to? Just plop it in the magnetic pocket. Need to keep some RFID items nearby but not so accessible that some passer-by can just scan your bag to steal your info? Drop it in the RFID protection sleeve. The glasses and phone pocket even uses a sort of suspended shell for keeping your valuables both accessible and somewhat safe. Sure, the shell is soft and bendable, but it’s better than having a pair of glasses bouncing around the inside of your bag. The larger pockets are no joke. The tablet pocket has soft lining and can hold 13-inch tablets. It goes beyond that by even comfortably holding a somewhat thicker Surface Pro 3 (below), complete with keyboard cover, which stretches to a little under 14” diagonally. The laptop compartment, with Pylow Protection Laptop Guard, easily holds thick 15-inch laptops not too much unlike this vintage Dell E6420 (below) that I found sitting around the office. It even had room to spare. While holding these items, ENERGI PRO easily held my gym bag complete with a change of clothes as well as the included accessory pouch for holding smaller necessities. The ENERGI PRO barely stretched or struggled to close. If you’re thinking about carrying around this kind of weight, then you’re probably worried about the comfort. Luckily the ENERGI PRO’s straps and mesh cushioning kept the bag snug and comfy. Sure, I’m personally used to carrying around pounds of tech with me throughout New York City. However, the ENERGI PRO’s well cushioned shoulder straps helped distribute the weight evenly without pinching or causing fatigue to my shoulders. The mesh cushioning on the back kept my back cool and breathable, allowing air to flow throughout my back. I even loved how the shoulder straps had Velcro ends for keeping the adjustment straps from dangling. With more pockets than you know what to do with, water-resistant lining, and a sturdy yet comfortable build, the ENERGI PRO excels as a tech bag alone, without even considering the benefits of the included battery.